It’s autumn throughout the Midwest. In some areas the trees are alive with color, in more northern reaches the trees are losing their leaves. A sweatshirt feels good in the mornings, we’re several games into the football season, and the early migrating birds have pretty much left. And, best of all if you like to catch fish, now is an outstanding time to do so. They’re instinctively fattening up for the winter, so if you can put a bait in front of them, chances are good they’ll bite. If you want to increase the chances for getting a big one to bite, you need to use bigger baits. Here’s why the fish like bigger baits in the fall, and a couple of ideas for using bigger baits. 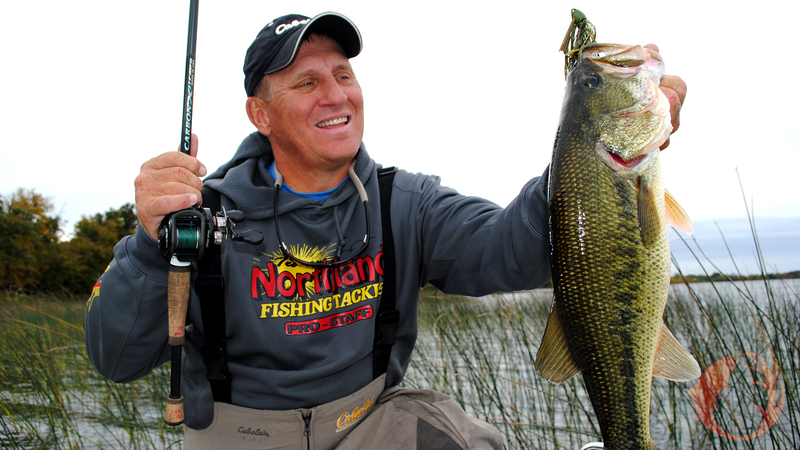 There are a couple of reasons why big baits are usually more productive in the fall. First, the days are getting shorter and the water temperatures are going down. This seems to signal to the fish that it’s time to put some fat on. The fish seem to prefer to eat one large meal instead of several smaller ones. It requires less energy for them to eat once than it does for them to catch several small meals. Also, the baitfish that were spawned in the spring are at a larger size now, and some baitfish that are fall spawners are more accessible to the predator fish. It seems that the larger predator fish are more interested in eating the size baitfish that are more abundant this time of year. If walleyes or smallmouth are your quarry, you can’t beat a big redtail chub on a live-bait rig. Redtails are expensive, and they can be hard to find, but if you can get some, the walleyes and smallmouth really like them. If you just want to get bit and aren’t looking for truly big fish, a fathead minnow on a Fire-Ball jig is about as good as it gets. Another option for smallmouth is drop shotting. I’ve had some memorable autumn days drop shotting for numbers of smallmouth and some big ones. The Dream Shot from Strike King is an outstanding plastic to use while drop shotting. Lew’s makes a drop shot rod in their Custom Speed Stick Series that is very sensitive but also has the power for good hooksets. Add a Lew’s spinning reel spooled with 6 or 8 pound test CX Premium P-Line and your set. If you’re after largemouth bass, you’ll want to try the deep weedline. Out here you’ve got several options for baits, but remember to go big with the baits. A rubber-legged jig with a big bulky piece of plastic will be good, and so will a spinnerbait with a larger than ordinary blade and tipped with large plastic. However to cover water and still appeal to bass, a crankbait is hard to beat. There are lots of crankbaits out there, but the 5XD that Strike King makes runs deep and true and is available in the best colors. I’m usually fishing clear water in the fall, so I like a bait that’s natural in color, something that looks like a bluegill, a perch, or a shad. Autumn is a great time to be on the water, and if you use big baits, you have the opportunity for a truly memorable fishing experience. Find that out for yourself in the next few weeks. Feature Photo: Here’s Mike Frisch with a nice largemouth that ate a bulked-up rubber-legged jig.